REELRADIO - The Andy Barber Collection! For Andy Barber, it all started when he was growing up in Los Angeles, listening to Top-40 radio. At the time, that included KPOP, KDAY, KFWB, KRLA, KHJ and KBLA. Andy says he was really lucky to hear all his favorite DJs, like Art Laboe, B. Mitchell Reed and Bill Ballance, but the guys that really inspired him to do radio and keep going after 34 years were The Real Don Steele, Robert W. Morgan, Humble Harv, Jimmy Rabbitt and Steve Lundy. 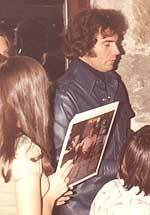 Andy was at KEYN until 1971 and got his first taste of excitement from winning the Billboard Magazine Medium Market Air Personality of The Year Award in 1970 & 1971. He got 38 job offers in 3 months time. 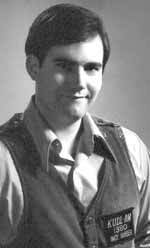 From 1970-1989, Andy got nominated every year for DJ of the year. His first big on-air interview was with Phil Spector, and then Casey Kasem. 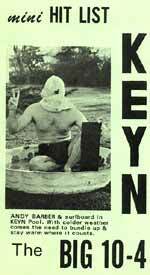 KEYN was among the first stations to carry American Top 40. His first big promotion (1970) was getting a surfboard and trying to "surf" the Arkansas river! When he left KEYN, somebody called The Real Don Steele, Robert W. Morgan and Charlie Tuna, and they all did "Good Luck" phone messages for him. In 1971, he moved to nights at KUDL/Kansas City and later, Program and Music Director. In 1972, he went north to KING-AM in Seattle, Washington for the 6-10 PM shift, and posed for Playgirl magazine. "This is where I got into my Street Profile," says Andy, "working the clubs and making many public appearances." 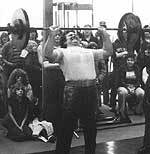 As of 2002, Andy says his total number of public appearances is 4,123. Andy was Assistant P.D. and Music Director, in addition to Afternoon Drive at KSTP-AM (Minneapolis-St. Paul) in 1974, and in 1975, he ran for Mayor of Spokane while doing afternoon drive at KREM in Spokane, Washington. He returned to KING in Seattle in the 6-10 PM slot from 1975 until 1977, and ran for Governor of Washington. 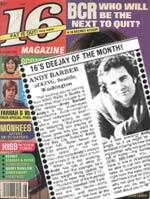 During his second tour at KING, he was selected as DJ of the Month by 16 Magazine. 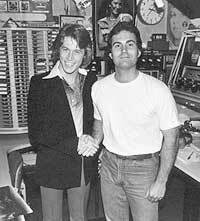 In 1977, Andy headed home to Los Angeles as a utility jock to work with his "all-time idol", The Real Don Steele, at KTNQ. After Steele left 10-Q, Andy did afternoon drive. From 1978 through 1981, Andy continued to work in Top 40 and CHR radio at KYTE in Portland, Oregon; KULF in Houston, where he roller-skated on top of the Houston Astrodome; KMGC in Portland, Oregon, and in 1981 through 1982, middays at KWST/KMGG in Los Angeles. Andy continued his radio career through the '80's in Dallas, Salt Lake City and Louisville, KY. Andy Barber has been on the air in Tulsa, Oklahoma since 1993. Visit Andy on the web at www.andybarber.info. The Repository thanks Andy Barber for sharing!
. . . If little girls are made of sugar and spice and everything nice, then how come they sold over a million dollars worth of feminine hygiene spray this year . . .
At KREM, Rob Glendenning was the Program Director. Bruce Murdoch and Rob Harder were also on the staff. 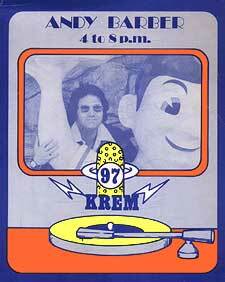 This was an exciting radio station, and one of the best teams I ever worked with in ALL my career!
. . . and specially selected theatres and drive-ins where they don't have stale popcorn . . .
At KTNQ, the Program Director was John Driscoll, and I got to work with my idol  The Real Don Steele! He was the first to introduce me "next" on 10-Q, and I almost passed out! The Real Don Steele was kind and understanding  and he remembered me from the Don Martin Radio School and Wichita. WOW!! Also, on the staff; Machine Gun Kelly, Nancy Plum, Jack Armstrong, and Dave Sebastian. Reel Top 40 Radio Repository ©1996-2003 REELRADIO Inc.